After launching the MP2015 4-channel DJ mixer last year, Rane introduces a 2-channel version, the MP2014. Mixars offers an overview of their line of DJ-oriented products. Reloop introduces two new RMX-22i and RMX-33i digital two and three-way DJ mixers with smartphone and tablet connectivity. 2 years after it was discontinued, Rane announces the return of its TTM57 DJ console with built-in audio interface in a new version for Serato DJ. Akai started shipping its new AMX and AFX MIDI controllers for Serato DJ. Serato released a small update for its Serato DJ mixing software, that will be useful to Akai AMX users. Numark introduced last weekend at the BPM Show the Total Blackout edition of its M-Series DJ mixers. Allen & Heath announces a new version of its Xone:23 DJ mixer with built-in sound card, which will be introduced tomorrow at Musikmesse 2014. The DJ department did not offer many novelties this year at NAMM, however DJ Tech had an impressive booth with 2 new mixers, among others. 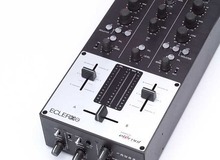 Allen & Heath will introduce at Winter NAMM 2014 a new Xone 2+2 mixer for DJ, namely the Xone:23.